The QX100™ Droplet Digital™ PCR (ddPCR™) system provides an absolute measure of target DNA molecules with unrivaled performance in precision, accuracy, and sensitivity for quantitative PCR applications. The Droplet Digital PCR system is the third generation of PCR technology and provides a revolutionary approach to target DNA quantification. The QX100 droplet generator partitions samples into 20,000 nanoliter-sized droplets. After PCR on a thermal cycler, droplets from every sample are streamed in single file on the QX100 droplet reader. 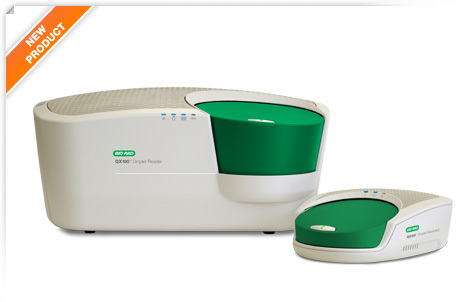 The PCR-positive and PCR-negative droplets are counted to provide absolute quantification of target DNA in digital form.